This is the story of Lukas, a three-year-old who is too embarrassed to tell his mom and dad that he is scared of thunder. When he finally does, his dad takes him on a magical journey that eases his fear and teaches him to never be afraid to confide in his parents. The images that illustrate this story are by artist and mother, Antonia Catsambas. You will notice that our characters are of unrecognizable race; this is done on purpose. Without making the actual story about race, we’ve chosen to use non-Caucasian people to tell it. Because we all know, we need diverse books. We hope you and children all over the world will enjoy it as much as we have enjoyed producing the story of Lukas. 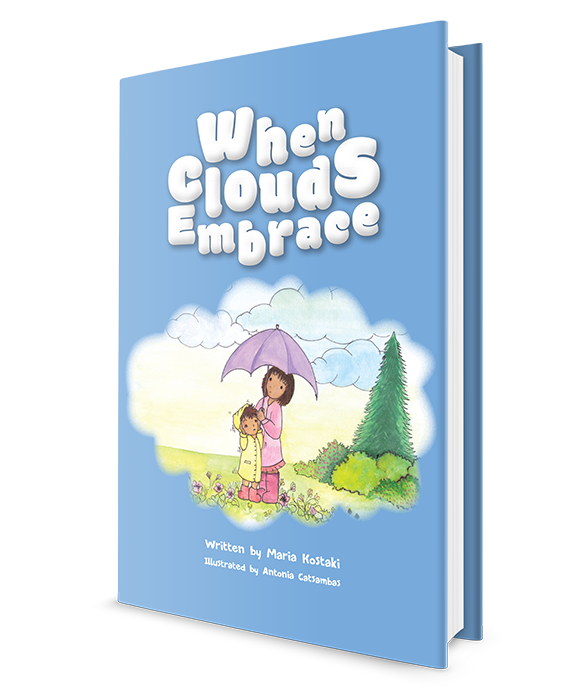 All of the proceeds from the sales of this book will be donated to Giving for Greece, an organization that works to help unaccompanied refugee minors in Greece. There are hundreds of children without parents or guardians, currently in our country, some have lost their parents to the war in Syria, others have lost them along their trek to safety from other countries in the Middle East. The refugee problem is not limited to Greece, to Europe; it’s an international humanitarian disaster that we all need to be aware of, and to be part of the solution, in any way we can. By purchasing our book, you have done a selfless deed, and we promise that your contribution will be put towards the warmth, shelter, safety, food, and above all a smile on a child’s face.